We worked with the Grand Traverse Conservation District and the owner of Twin Birch Golf Course, located along the North Branch of the Boardman River in Kalkaska, to implement best management practices to reduce erosion and excess nutrients from entering the river. Improvement included stabilizing a severely eroding stream bank, planting riparian buffers along 700 feet of the Boardman River running through the golf course, and re-shaping two fairways to reduce runoff to the river. 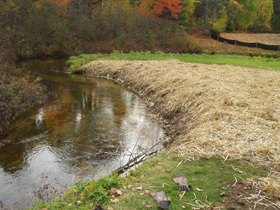 Buffers are extremely important along rivers and other waterways to reduce the impacts of pollutants in runoff and to provide bank stabilization. More than 11,000 square feet of buffer strips were laid out along the Boardman River at Twin Birch Golf Course.